Nearly 100 varieties of hardy and tropical water-lilies and other aquatic plants, including elegant sacred lotuses, offer a stunning summer display on Lily Pool Terrace. Spectacular year-round, visitors enjoy the serene reflecting pools, fountains, and border gardens, which are also popular with local birdlife such as ducks and the occasional heron. The centerpiece of Lily Pool Terrace is the Jenkins Fountain, located directly in front of the Palm House. Two large rectangular pools are situated to its north and south, bordered by the Mixed Perennial Border and Annual Border. BBG’s Terrace Café is located just off the terrace. The pools are planted with nearly 100 varieties of hardy and tropical water-lilies and sacred lotuses, creating a stunning attraction in July, August, and September. The Perennial Border, on the east side of Lily Pool Terrace, is a semipermanent installation of woody and herbaceous plants that offer a continuous display of bloom from spring through fall and lovely structural interest through the winter. The Annual Border, lining the west side of the pools, comes alive in early spring with its famed bulb display, including thousands of tulips, alliums, and other spectacular spring bloomers. Each summer brings a unique new design of colorful flowers and foliage plants created by the garden's curator. There are several species and cultivars of sacred lotus (Nelumbo nucifera) in BBG's lily pools. In Buddhism, they are considered "emblematic of the soul of man, resting always in calm above the surging activities of the world; existing in the sunlight pure and undefiled; rooted in the world of experience." Wayken Shaw is the curator of the Judith D. Zuk Magnolia Plaza and Lily Pool Terrace, including the Annual and Perennial Borders. After earning a master’s in landscape architecture from the University of Arizona, Wayken practiced urban design for nine years on both coasts before pursuing a more “hands-on” career in ornamental horticulture through a joint program between Bronx Community College and the New York Botanical Garden. Wayken sees gardening as an important connection between form and function, with plants as an aesthetic, educational, and physically comforting medium for defining space and creating a sense of place in our urban fabric. Construction of Lily Pool Terrace began in 1919, shortly after the original conservatories were completed, and was finished in 1921. The pool surrounding the Jenkins Fountain originally had cattails planted between large rocks near the base of the fountain. Since the rocks and cattails were removed in the 1970s, an assortment of water-loving plants has been displayed seasonally, including elephant ears and pitcher plants. 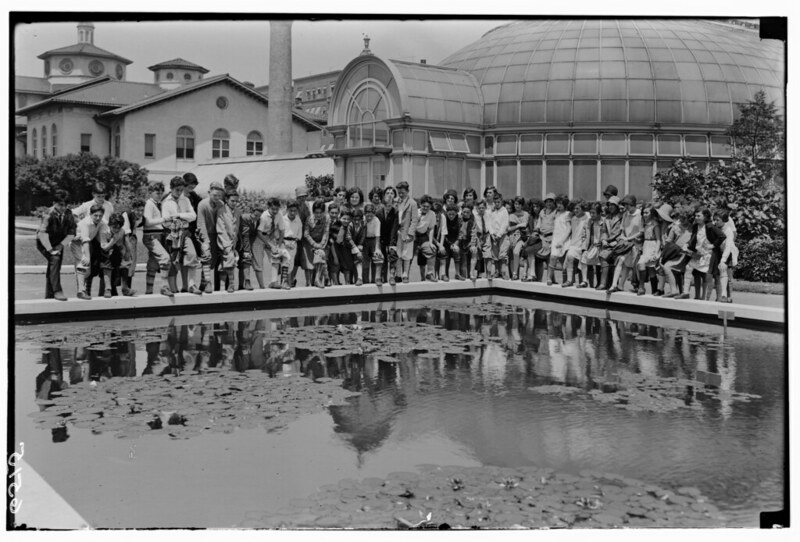 Originally, the north pool was heated by hot water piping and was used to display tropical water-lilies, and the south pool was devoted to a collection of hardy species. In 1976, the global energy shortage and the economic crisis in New York City forced a decision to stop heating the north pool. Today the collection’s focus is on hardy water-lilies and lotuses, with a smaller selection of tropicals. The hardy specimens are planted in large tubs set directly on the floor of the pools, while the tropical water-lilies and lotuses are raised above the pool floor to take advantage of the warmth from the pool’s natural thermocline. The small arc-shaped pool located at the northern end of the terrace is called the Lion's Head Pool for its fanciful wall fountain. It is the smallest of the pools and displays a rotating variety of species, such as papyrus and pitcher plants. 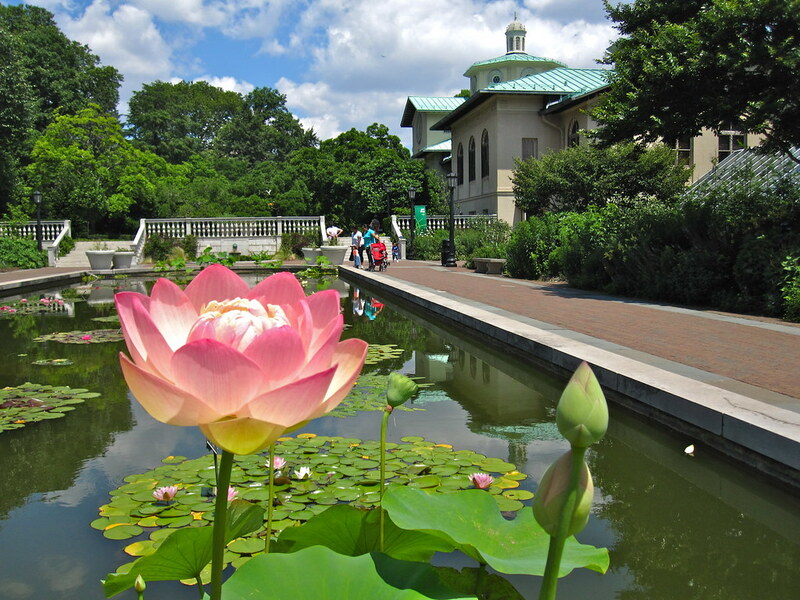 A sacred lotus bloom in the north pool of Lily Pool Terrace. Photo by Rebecca Bullene.